EUR/USD consolidates its gains as the quiet recovery continues. Brexit is heading to a delay and tension mounts ahead of the Fed. The technical picture is bullish for the pair. EUR/USD is trading in the mid.1300s, getting comfortable on the higher ground. The pair hit a two-week high on Monday, extending its quiet gains. It seems that another break to the upside is just a question of time. In the UK, the government’s plans to bring the Brexit deal to a third vote (MV3) were thrown out by the Speaker of the House John Bercow. The government is scrambling to find a workaround and to garner support for the deal. Nevertheless, chaos raises the chances of a delay. The pound recovered swiftly, and the euro remains supported. Another source of calm comes from the tension mounting towards the US Federal Reserve decision on Wednesday. The Fed is set to keep its policy unchanged and publish new interest rate projections. The famous “dot plot” is likely to show a lower path of rate hikes, supporting the message of patience. The US Dollar has come under pressure on this speculation. A light calendar awaits traders in the remainder of the day, with US factory orders being the only notable number to open an eye for. The next movements, therefore, depend on sentiment. Developments around Brexit and trade will likely have an impact, while speculation around the Fed could limit movements. The thick black lines on the chart show that euro/dollar is trading in an upwards wedge, or triangle. The lines are narrowing but point to further gains. 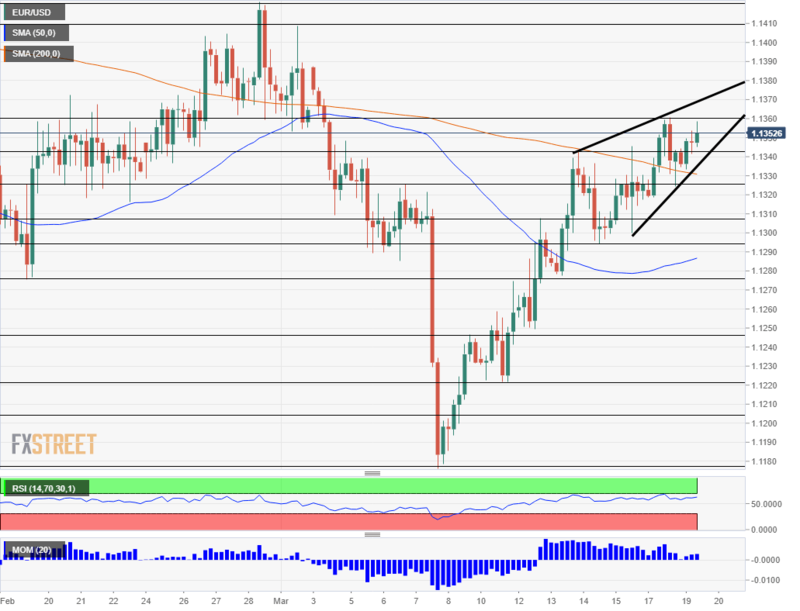 EUR/USD is enjoying upside Momentum on the four-hour chart, and the Relative Strength Index is positive but does not reflect overbought conditions. The pair is also trading above the 50 and 200 Simple Moving Averages. 1.1360 is the immediate line of resistance after having capped the pair recently and serving as support earlier. 1.1410 waa swing high in early March, and 1.1420 was the high point last month. 1.1485 looms far above. 1.1340 was a point early last week and is where the uptrend resistance line begins. It is followed by 1.1325 that was a low point on Monday and by 1.1305 which was a swing high last week. 1.1295 and 1.1275 were stepping stones on the way up.